Safety is paramount when you own a car garage, and ensuring you use sturdy and reliable equipment should be at the forefront of your mind when looking to add to your toolkit. 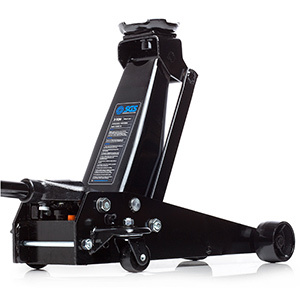 At SGS Engineering our 3 ton car jack range is just what you need for safe and secure lifting. Specifically designed as a 3 ton garage jack for lifting cars and other vehicles, you can count on our selection to help you get the job done confidently every time. Which 3-ton heavy duty trolley jack is right for my needs? Whether you’re working in a professional garage environment or you’re a car enthusiast or hobbyist, a 3-ton trolley jack from SGS won’t let you down. Each of our products feature robust steel construction to make them safe and stable, and many boast steel castor wheels to make manoeuvring your 3-ton car jack easier and more convenient. There are great added extras on some models such as non-slip, rubber jacking pads to stop your cars and vehicles getting damaged while the 3t trolley jack is in use. Can I buy a 3-ton garage jack online today? To ensure you choose the right 3-ton trolley jack for your needs, our knowledgeable staff will be on-hand ready to assist you with any queries you might have about our range. Know what you need already? 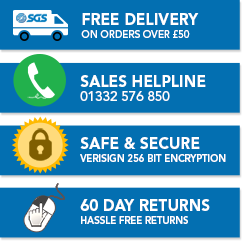 Simply take a look through what’s available and place your order on a new 3 ton heavy duty trolley jack with us – and if you order before 4pm, you’ll also qualify for free next-day delivery. Lifting and working under a vehicle is an essential requirement for any home garage. Without the right lifting equipment, working under a car can be very dangerous. Learn how to safely lift a car with a set of axle stands and a 3 ton trolley jack with this handy how-to guide from our experts here at SGS Engineering.